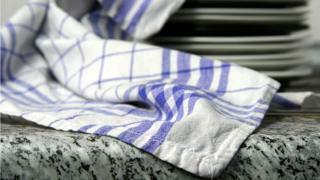 Multi-use of tea towels is putting households at risk of food poisoning, research suggests. Scientists from the University of Mauritius examined 100 towels that had been used for a month. They found E.coli was more likely to be found on towels used for multiple jobs, such as wiping utensils and cleaning surfaces, as well as drying hands. It was also more likely to be found on damp towels or those in households where meat was eaten. Multiple use increases the chance of cross-contamination of potential pathogens that can spread bacteria and lead to food poisoning. The government recommends washing or changing dish cloths, tea towels, sponges and oven gloves regularly and letting them dry before re-use. The research is being presented at the annual meeting of the American Society for Microbiology in Atlanta, Georgia. Scientists cultured the bacteria found on the towels to identify them and determined the bacterial load. Of the towels collected, 49% had bacterial growth, which increased in number with extended family, presence of children and increasing family size. Of the 49 samples which were positive for bacterial growth, 36.7% grew coliform bacteria, a group which includes E. coli. Of the rest, 36.7% were enterococcus spp and 14.3% staphylococcus aureus. Coliform bacteria and staphylococcus were found at a "significantly higher prevalence" on towels from meat-eating households. E.coli is a type of bacteria common in human and animal intestines. The majority are harmless but some can cause severe food poisoning and serious infection. The researchers said the presence of E. coli indicated possible faecal contamination and bad hygiene practices. "The data indicated that unhygienic practices while handling non-vegetarian food could be common in the kitchen," said lead author Dr Susheela Biranjia-Hurdoyal. "Humid towels and multipurpose usage of kitchen towels should be discouraged. Bigger families with children and elderly members should be especially vigilant to hygiene in the kitchen," she said. They found staphylococcus was more likely to be found on towels from families with children and of lower socio-economic status. Staphylococcus can cause food poisoning as the bacteria multiply quickly at room temperature to produce a toxin that causes illness. It is killed by cooking and pasteurisation. E. coli: Are the bacteria friend or foe?